As part of the pre joining process, we conduct a range of Due Diligence across the school. The Due Diligence process is as much about us finding out how we can work effectively with you; as you finding out how you can work effectively with us. The purpose of both parties carrying out due diligence is to ensure that you fully understand all of the opportunities, benefits, risks, assets, liabilities and relevant information to make a fully informed decision about whether entering into our Multi Academy Trust or changing Multi Academy Trust is the right decision for your own organisation. 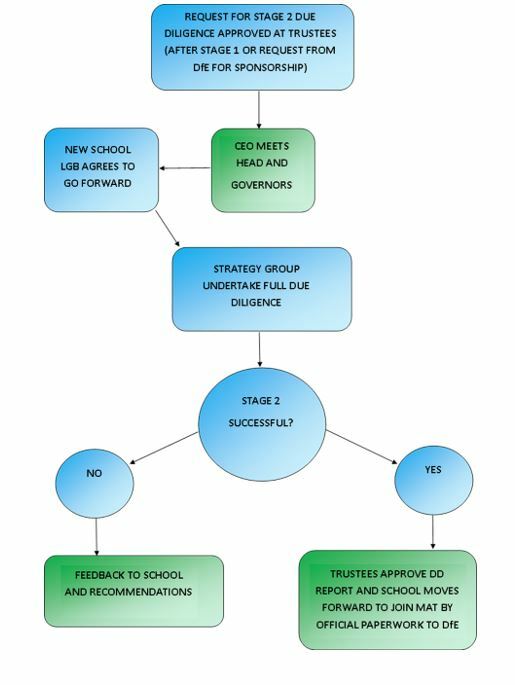 This is a brief documentation process for all schools who wish to ‘register their interest’ in joining Apollo Partnership Trust. This process allows our Trustees to make an informed judgement on whether to go forward with the next stage of Due Diligence. When Trustees have decided to move forward with full Due Diligence, a team of staff and/or external consultants working on behalf of The Apollo Partnership Trust will visit your school. This is a more rigorous process that allows the MAT to gain an understanding not just on what you can offer us but on what we can offer you. Upon successful completion of Due Diligence 2 if a school wishes to move forward and join our MAT, the Trusts Central Team will work closely with them on the final stage of official paperwork, run through non-negotiables, and work out a full transition timetable for induction. All schools within The Apollo Partnership Trust commit to the same principles of working. These principles are covered in our ‘Non-Negotiables’. These shared and agreed set of non-negotiables have been developed over time and will remain under regular review as The Apollo Partnership Trust grows. It is important that all prospective members of the Trust are clear about these ‘non-negotiables’ that underpin the work we do and sign up to them when joining The Apollo Partnership Trust. To display, support and embrace the shared vision and values of the MAT. Have regard to and action the provisions of the Articles of Association. Have regard to and action the provisions of the Governance Terms of Reference and Scheme of Delegation. To agree a full governance post conversion induction process. Share joint responsibility to the improvement of all schools in the MAT including embracing all actions agreed by our MAT Improvement Team and at Executive Board. A willingness to be open and share ‘outstanding’ practice. To share and support joint Training & Development days across the MAT. To fully support the work of the Executive Board; including half termly attendance, actions and deadlines. To ensure complete transparency on school documentation including SEF, SDP, Performance Management and Finance accountabilities. To engage joint assessment practice across the schools with all staff working together on moderation. To commit to a financial percentage for implementation of central services, with percentage dependent on the needs of the school. Currently the commitment is 5% of the AWPU for all good schools. To maintain robust systems of financial control including five year budget forecasting, to ascertain the sustainability of current levels of expenditure. Implementation of all MAT policies/HR policies and procedures/and The Apollo Partnership Trust contracts. To share a willingness to participate in all The Apollo Partnership Trust Events. 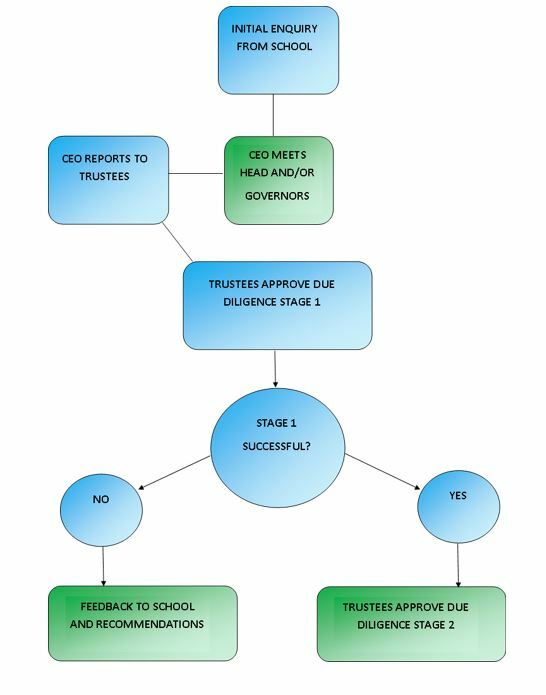 As part of the pre-joining process, we conduct a Due Diligence on school governance. This allows the trust to agree a way forward that best meets the needs of the school. Identifying past training and professional development opportunities for governors, chair and clerk. Arrange full induction programme for all current and new governors going forward. The table below is not an exhaustive list but to high light areas that will be covered under the due diligence processes through stages 1-3. It is important that once a school joins the MAT training is given in the first few months. This timetable allows staff the ability to understand their roles in the trust and gain a better understanding of how all the schools function as a whole.